Presenting Three Dark Crowns #1 Three Dark Crowns by Kendare Blake. Three Crowns. Three Sisters. A mysterious island. A vicious duel to declare the Queen Crowned and the general bloodbath. This is the story of Katherine, Arsinoe and Mirabella. Sisters. Queens. Each said to possess three separate gifts and raised since infancy to .... well fight it out. I have been a fan of Kendare Blake's words since 'Anna Dressed in Blood' and damn do i say this book is another milestone of her pen. Decidedly dark and a little creepy. 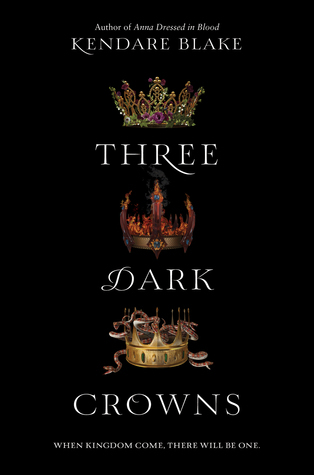 Three Dark Crowns divides the story into three points of views. Namely, Katherine (Poisoner), Arsinoe (Naturalist) and Mirabella (Elemental). One can digest any poison without breaking a sweat, one can bloom any flower with just a nudge and the last one capable of controlling the elements. Of course two of them are faking it. And obviously political and conspiratorial influences are not far behind. All three stories or better yet point of views tells three separate stories and respect for the author for keeping the characters separate, beautifully meshing together in a crescendo of a revelation. Some very much unexpected and surprisingly well placed. Since this book hasn't released yet, so I well endeavor to keep what I tell next spoiler fee. Although I will say this that while the three POVs are equally distributed it still felt that Arsinoe and Mirabella's stories took center stage and Katherine's lost its shine after an epic first chapter. Throughout the story it is said that Mirabella is the strongest and ruthless. It seems she does have a soft side. Where each groups raise each of the Queen to kill her opponent sisters but she seems to still old a particular regard for them. Although I will say this the part of Mirabella and Joseph really brought down the story for me. So it gets a few stars less. Arsinoe on the other hand maybe the weakest of them all but her leap before looking attitude maybe he best quality and felt a tad reckless. As well as Katherine's struggles with her fare share but as the story progresses, evolves into a consummate poised Queen, charming to boot. Her chapters were definitely my favorite and the most dark. While Katherine doesn't get much spotlight it looks like she will in the next book. So i'm very excite to see what happens next. Kendare Blake does has a flare for the dramatics. There is a constant tug-of-war of ideals and powers, the added drama, romance, politics and out-of-bounds conspiracy afoot. This is only the first book o the series and while the stated negatives put me a bit off. I will definitely be on the look out for he sequel. "A darkly enticing series debut"